Legionella Testing In Spa Pools- Is it time to take a new approach ? Is this really still the best practice? What action can you take if you receive a positive result after 14 days – are we too late? If you get a negative result is the system actually safe now it is 14 days later? If there was a way of obtaining an instant reading, wouldn’t this be better? Legionella pneumophila, is a waterborne bacterium which can cause Legionnaires’ disease, Pontiac fever, or other diseases, collectively known as Legionellosis. Around 15% of patients die of Legionnaires’ disease and between 95-100% of people exposed to Legionella pneumophila will contract Pontiac Fever, which has flu-like symptoms. What does the HSG282 say about legionella testing in spa pools? Spa-pool systems, which include whirlpools and hot tubs, are a known source of diseases including Legionnaires’ disease. Hot tubs or spa pools are popular in gyms, hotels and increasingly in people’s back gardens. Hot tub sales in the UK are growing at more than 20% a year, much of which is due to installations at leisure and holiday rental properties. The water in hot tubs is typically kept around 30 to 35C, which is the ideal temperature for Legionella bacteria to grow. The aerosols produced by splashing and bubbling in a hot tub can then throw the water droplets contacting the bacteria into the air, and these can then float, potentially for considerable distances. As a result, you don’t even have to be sitting in the hot tub to inhale the bacteria, though an infected tub can create dramatic levels of exposure for those that do. 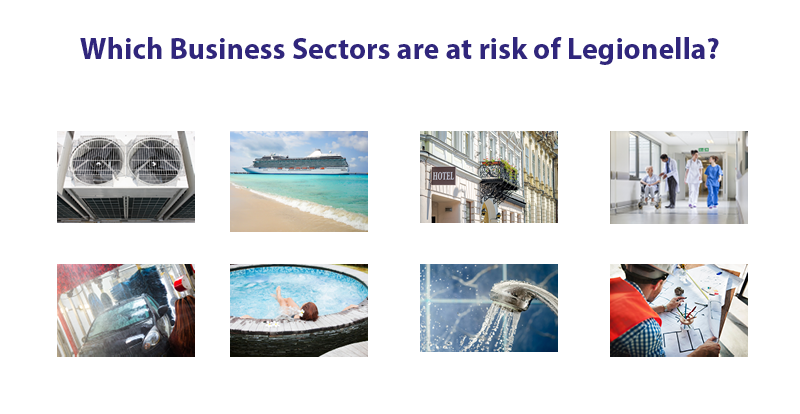 Outbreaks of Legionnaires’ disease have been linked to spa pools in leisure centres, hotels, holiday homes and cruise ships and other facilities. HSG282 was published in January 2017 to help those that manage Spa pools to reduce the risk and includes details on maintenance and design as well as water chemistry such as disinfection levels and pH. The systems of filters, pumps and pipes, used in spa pool are complex and have significant surface areas upon which biofilm may build up. Biofilm is an ideal breeding ground for Legionella and it will protect the bacteria from biocides. Therefore, these components need to be well-managed to ensure the purity of the water and reduction of bacteria levels. Testing of water quality, using chemical and microbiological monitoring, is an essential part of the spa-pool treatment regime. Water in spa-pools should be routinely analysed to ensure the effectiveness of the water management programme. The frequency of testing will depend on risk factors and will typically include ‘daily, monthly and/or quarterly actions’. The risk factors may include volume of water, operating temperature, location of the pool and bather loads. This must be done by UKAS accredited lab. However, the guidelines also suggest that additional routine microbiological sampling should be carried out to minimise the risks. The alternative testing methods can be used to enable faster and better-informed decision-making process. The reason being that even small variations in temperature or biocide level can result in non-conformance and a possible loss of control. The recommended call for action for spa pool is >1000 CFU Legionella per litre. If testing indicates levels above 1000 CFU/L immediate closure of the pool is recommended. If testing indicates levels of > 100 CFU/L and up to 1000 CFU/L reviewing control measures and carrying out remedial action is recommended. However, considering the fact that Legionella pneumophila can proliferate very rapidly, potentially doubling population within a mere 24 hours, waiting 14 days for your reading could lead to an unwanted situation. Slow time to result is a very high-risk factor, especially since the risk of acquiring Legionnaires' disease can increase by 64% for every hour spent near the source of an outbreak. This is why the HSG suggest that additional routine testing should be carried out. A rapid testing method allows duty holders to take a new, holistic approach to the risk management that focuses on prevention and control of risks associated with Legionella bacteria, rather than on taking a delayed action upon receiving historical results. One of the alternative testing methods for Legionella available on the market is rapid antigen testing. Antigen testing is optimised to quickly detect cell surface of Legionella antigen on-site, in environmental water and biofilm samples, and in all phases of the Legionella life cycle. The test is designed to be highly specific for Legionella pneumophila serogroup 1-the species of Legionella which causes 95% of all cases of Legionnaires’ disease. Rapid testing can be done on-site and provides results in 25 minutes. This is a massive improvement from a traditional lab testing method which takes 10-14 days to provide results. Reducing public and employee health risk by minimising the time taken to identify Legionella. Improving the accuracy of the results by testing for Legionellaon-site, in its natural environment. Improving detection rates of Legionella sg1by detecting Viable but-non-Culturable bacteria, which cannot be detected by the lab culture method. Receiving an immediate picture of Legionellacontamination risk. This enables duty holders to make quicker, better- informed decisions about improving water quality. Minimising the complexity of a laboratory test by carrying out an easy self-test. Several types of rapid tests for Legionella have been developed for use in environmental water samples, but only the Hydrosense antigen test can be used on-site without using further analysis. HSE guidelines for the control of Legionella bacteria in spa pools insist on the importance of keeping a record of precautionary measures and control treatments. Records help to prove that adequate actions to prevent the disease were carried out. In a response to this need, Hydrosense developed a smartphone test reader app and an online logbook which, for the first time, enable the real-time risk management of Legionella. The smartphone-based reader is designed to semi-quantify test results and read the test more accurately than a human eye. It also offers a function to share the test results with duty holders immediately which enables faster decision-making process. The data recorded from the smartphone reader (i.e. test results, temperature, biocide, date, location, notes, etc.) is then automatically synchronised with the Hydrosense Pro portal. In the portal the user can view information from various locations and users, set alerts (automatic notification when parameters go out of conformance), schedule tests, print our certificates and much more. Spa pools are a recognised source of diseases caused by infectious agents including Legionellatherefore they need to be monitored and well-managed to reduce bacteria levels. Using Rapid testing will provide an immediate answer on the need for corrective action. Why wait 14 days for the lab test results if you can get answers immediately, on-site? 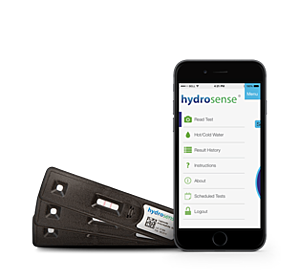 No training or experience is required to carry out Hydrosense test. This means that now anyone can test spa pool in their back garden. Filter the water sample using the tools provided, drop a water sample on the test and leave it for 25 minutes. It could not be easier. The rapid test has a recovery rate of 80% compared with a variable rate of 10-80% for a lab test (‘recovery rate’ refers to the frequency with which a test can detect a positive sample). It also detects the motile form of bacteria which is the most dangerous to humans but cannot be cultured in the laboratory. Hydrosense test is very sensitive (100CFU/L) and is as simple to read as a pregnancy test – one line signifies a negative result and two lines indicate a positive result. This means that receiving a positive result from Hydrosense test is a call to action and should result in reviewing control measures and carrying out remedial actions. It is recommended by HSE to carry out Legionella lab testing on quarterly basis. Nevertheless, there are clear advantages of using the rapid test in between these periods as a continuous monitoring tool to minimise the risks associated with Legionella bacteria for customers, staff and the general public.